The best wearable camera is back - but is it worth the upgrade? The action camera is a product category that GoPro practically invented and has dominated ever since, despite an increasing number of alternatives. So how do you improve on the best? This year's Hero4 line-up features a top-end Black edition (£409.99/$499.99), which we're reviewing here, and a Silver edition (£329.99/$399.99), which we'll also mention briefly. A decent value entry-level Hero camera (£109.99/$129.99) completes GoPro's current range. These are cameras that capture eye-popping footage in scenarios where you just can't take your smartphone or camcorder, and if you head over to the GoPro site you'll find a host of accessories and attachments to choose from. All of the current add-ons work with the new models, with the exception of the batteries, which have been given a slight redesign. GoPros are for fastening to surfboards, strapping to bike helmets, sticking on ski poles and so on. They're also ideal for drone filming and getting a camera anywhere you wouldn't leave a camcorder – each model comes with a waterproof casing to keep out the rain, wind and snow. A major part of GoPro's appeal lies in its compact matchbox shape and the manufacturer hasn't meddled too much with the formula for the Hero4. The dimensions (41 mm x 59 mm x 30 mm) are the same but the battery cover has been shifted underneath. The button on the side of the box now lets you access settings more easily, as well as turn Wi-Fi on and off, and the on-board interface is more straightforward and intuitive to move around. As before, you get a waterproof case in your grand Hero4 Black packaging (safe up to 40m), but you don't get the bundled Wi-Fi remote any more – that's now a £64.99/$79.99 add-on from the official store, though you can use your iOS/Android smartphone as a remote if you prefer. A protective flap hides HDMI-out, a USB port and the microSD card slot. Both the screen and the status lights are now bigger and easier to see than on older models, and we'd say the design tweaks are largely to the GoPro's benefit. The Hero4 Silver, meanwhile, comes with a very handy integrated LCD touchscreen, though the camera doesn't reach the same frame rate heights as the Black edition – many users will probably accept that trade-off for a cheaper price and a built-in display. In terms of features and functions, the Hero4 range isn't a huge step up from the Hero3 and Hero3+ models. There are a wealth of video and photo modes to choose from, of which more shortly, but GoPro has added some new tweaks worth pointing out. Bluetooth is now included in the mix, but this only lets you control the camera via a smartphone – you can't pair a set of speakers or a microphone, for example. A new highlighting feature has also been added, giving you the ability to tap a button to mark a particularly important bit of footage right after you've shot it – that can make a big difference when you're trying to sift through the best parts of your video after four hours of filming. It's worth noting that the internal processor is twice as powerful than the Hero3+ line-up, meaning higher frame rates at a greater stability with fewer dropped frames. As far as storage goes, meanwhile, the camera can take microSD cards up to 64GB in size, though make sure you buy a fast one if you're using the top-end video formats. The headline feature of the GoPro Hero4 Black is a new high watermark as far as video resolution quality goes: 4K (3840 x 2160 pixel) video at 30 frames-per-second. 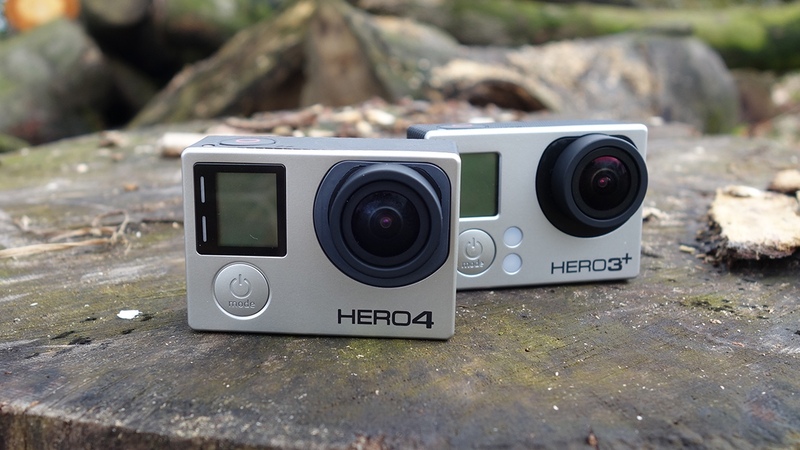 Last year's Hero3+ Black and this year's Hero4 Silver top out at 15fps for 4K, which isn't really usable. And gorgeous video it is too, assuming you have the computer to be able to handle editing it – in terms of low-light performance, colour contrast, image sharpness and choice of video modes (there are a total of 49 to choose from) the Hero4 Black can't be faulted. It's like having a professional movie camera in the palm of your hand, and if you head to YouTube you can see some of the results that are possible. You can record 1080p video at up to 120fps (full HD in 1/4-speed slow-motion) and 720p video at up to 240fps – that's still a decent resolution but an incredible 1/8th-speed slow-motion. Time lapse videos can be created in 4K and 2.7K resolutions, and – unlike the Hero3+ – the camera actually stitches together the shots for you, which is a welcome improvement. Note that some features, such as 240fps slow-motion and time lapse stitching, require the latest firmware – you may have to upgrade your camera once you've unpacked it. Let's not forget the GoPro's still image capabilities. The protruding f/2.8 lens offers a 170-degree point of view and captures just about everything put in front of it with ease. You can choose from 12-megapixel (wide), 7-megapixel (wide and medium) and 5-megapixel (medium) modes, and there are photo burst and night mode options to take advantage of too. When we tested out each of these modes, GoPro's internal optics once again proved comfortable with most challenges – it won't replace your DSLR but it is a step up from the majority of smartphones on the market. The night mode in particular showed an improvement when we tested it against the Hero3+ Black. There are a limited number of ISO, white balance, exposure and colour modes available too, which some users may want to tinker with. Perhaps the only major downside of the Hero4 Black is the battery life: you'll struggle to get through an hour of filming with Wi-Fi enabled, though of course you can bring a spare. The bundled software is nothing to write home about either, but overall it's another stunning device from the GoPro stable. The quality of the video footage and photos created by the GoPro Hero4 Black is hugely impressive considering the small size of the package (which means you can take it or strap it or mount it anywhere). For most people, though, the cheaper price, integrated screen and simpler mode selection of the Silver model is going to carry the most appeal.